A Voyage Long and Strange 0 Edition W hat happened in North America between Columbus's sail in 1492 and the Pilgrims' arrival in 1620? 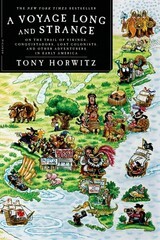 On a visit to Plymouth Rock, Tony Horwitz realizes he doesn't have a clue, nor do most Americans. So he sets off across the continent to rediscover the wild era when Europeans first roamed the New World in quest of gold, glory, converts, and eternal youth. Horwitz tells the story of these brave and often crazed explorers while retracing their steps on his own epic trek--an odyssey that takes him inside an Indian sweat lodge in subarctic Canada, down the Mississippi in a canoe, on a road trip fueled by buffalo meat, and into sixty pounds of armor as a conquistador reenactor in Florida.A Voyage Long and Strange is a rich mix of scholarship and modern-day adventure that brings the forgotten first chapter of America's history vividly to life.